I recently bought a copy of Pugad Baboy 21 in the bookstore. 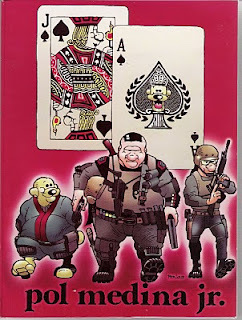 Pol Medina Jr. made another hit with this 21st book in the Pugad Baboy series of comic compilation. In this book, Dado, the werewolf character from story arc "Aso" in Kinse (PB 15), makes a come back appearance in the story "Bodyguard". "Bodyguard" features Tomas Sabaybunot as the main character for the story. Pugad Baboy 21 contains another set of laughter filled antics from our favorite characters like the unending "asaran" of Mang Dagul and Brosia, the favorite mealtime topics of Mang Dagul and Polgas that irritates Debbie, and a lot more.